Yes, this is yet another of those articles about Samsung’s fingerprint sensor, although it’s been a while since we had much reason to complain. 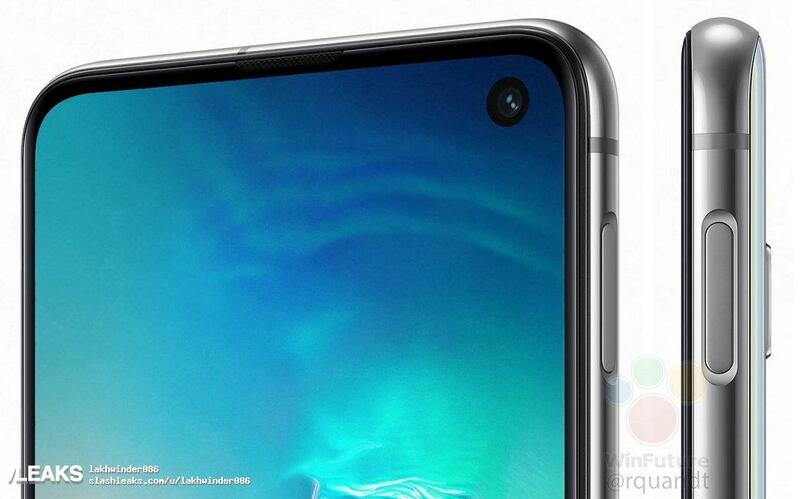 But recently leaked renders of the Galaxy S10e that confirm a side-mounted sensor embedded in the power button have made me realize Samsung isn’t done fixing its fingerprint sensor problem, at least not completely. The Galaxy S10 and Galaxy S10+ are getting an in-display fingerprint sensor, and it looks to be quite ergonomically placed based on the freshly leaked images of an actual S10+. But at the same time, it seems the power button on the Galaxy S10e is placed a bit too high up. Now, I realize that the smaller bezels mean the Galaxy S10e will be more compact compared to the Galaxy S9 despite a 5.8-inch screen on both. It’s still a cause for concern, though. I personally would never go for the smaller Galaxy S flagship and it will be the same this year, but how is it that Samsung continues to have issues with placing the fingerprint sensor in the ideal location? It was two years ago that the Galaxy S8 came along and asked us to adjust to a sensor placement that mostly favored those with ET-like fingers. Here in 2019, it looks like the problem isn’t completely solved. Worse still, there is not going to an iris sensor on this year’s flagships. Fingerprint and facial recognition are going to be the only two options (and we all know facial recognition is far from the quickest or most accurate biometric method). I sure am hoping I’m wrong and the Galaxy S10e allows easy access to the fingerprint sensor for people of varying hand sizes. But, if it doesn’t, it may just end up defeating the purpose of a compact flagship. I think that you’re jumping the ship on this one, since the device is not yet out. Once it is, and people can actually get the device in their hands, they can judge for themselves as to if they can handle the position of the power button and if it’s good for them or if it should ‘ve been in a better position. The fingerprint scanner placement in my opinion is ok, it’s in the natural position where we naturally stretch our thumb to unlock our phone’s, and as most comments say, there is no perfect location for the fingerprint scanner, since we all do not have the same size of hands. For me, the best place where in the home button like in the S7. But now that’s not possible. So now I think the best solution is under the display. The shoes is a very good analogy Gunter. I would probably find it perfect, but my wife wouldn’t. However there are alternatives such as facial recognition or pin, and even keeping the phone unlocked with your smartwatch if you have one. It’s not like you need to rely on only one method. But again you say the fingerprint sensor on the M20 is too far up. Too far up for who? For you? Or for me? Or for someone else? There is no such thing as too far up, or too far down for everyone. It just doesn’t work like this. Again you only give perspective from one hand size. Okay, fair point, but again, other manufacturers don’t have this issue, and for now Samsung is making it pretty much for those with long hands/fingers. So it’s not even close to ideal. Just sad there’s no in-display fingerprint sensor on the S10e I guess, probably want to keep price low. Exactly mt point. There is no correct place unless we are all clones and the same size. Oh by the way, the whole frame as a fingerprint sensor would be a great idea! You should get a patent! LOL. Of course there will still be people complaining that the frame is too flat, or too round. Some people just like to find things to complain about! Ah well, that’s true enough. We are all naturally selfish when we spend money and as you said unfortunately we cannot buy a phone to suit our personal preference like we can shoes or a pair of jeans. I can imagine people with short fingers not liking this, but they don’t have to buy this phone, they can get another model or another brand. Nobody holds a gun to their heads. If it doesn’t suit you, just move on. The S5 was better than the S4. Uglier, yes. But better. It was, IIRC, the first Samsung flagship to bring and IP rating for water resistance… Which Samsung removed on the S6 and got the deserved backlash for it, putting it back on the S7 (alongside the microSD card slot). I think this article is not needed. We will see after we play with S10e after launch event. Exactly. We must remember that no two peoples hands are the same size. This placement looks exactly the right place for me for example but for short finger people it might not. It’s a silly thing to discuss really unless every person on the planet has exactly the same size hands and Samsung put it in the wrong place for everybody. Seems ideal for me, I have to bend my thumb to reach the power button every time on my S8, and iPhone’s button is bigger and higher too(and more comfortable). Yes, but iPhone doesn’t have a fingerprint sensor on the power button. Has it either below display or has Face ID on iPhone X and newer phones, so ergonomics matter less there. And main issue is thar that Samsung either puts it too low or too high, never at the right place. But i guess we’ll see soon enough. but its there a RIGHT place for fingerprint sensor where to put? Exactly.. Everyone has different sized hands! @fuel3100. A very good point. There is no right place. Where I live with generally bigger, taller people it’s in a perfect place. People from Japan might find it too high for example. The thing is Abhijeet is that there is no ideal spot. Everyone has different sized hands so people with bigger or normal sized hands will be happy and smaller handed people not so much. If it was lower you will still have people complaining about it. We all look at this from our personal perspective, and that’s not really what we should be doing. I’ve big hands, the higher the better for me. My wife with small hands would prefer it lower. Tell me Abhijeet, what size are my hands compared to yours? How long are my fingers compared to your fingers? Does every person have the same hand size? I can tell you that amongst my compatriots this placement looks very good. There is no ideal placement. Every placement will be perfect for some, too low for some, and too high for others. Unless Samsung find a way to put a sensor in the exact place for every individual who orders the phone , which is not possible there will always be people not happy and people very happy.